An Italian magazine's decision to print a photo of a dying Princess Diana set off anger Friday in Britain, with tabloid newspapers leading the protests against the image and her sons expressing sadness. The black-and-white photo in Milan-based Chi magazine showed the princess receiving oxygen in the wreckage of the car crash that killed her on Aug. 31, 1997. The picture was excerpted from "Lady Diana: The Criminal Investigation," a new book by French author Jean-Michel Caradec'h. "Shame on you," scolded the tabloid Sun. The Daily Express called the image "grotesque" and swore not to reprint it. The Daily Mirror said the magazine's editor acted "shamelessly." Diana's sons, princes William and Harry, said in a statement Friday they were "deeply saddened." The Diana, Princess of Wales Memorial Fund said the photos were in poor taste. "A lot of people are appalled by the decision," said Mitali Atal, a fund spokeswoman. "The editor hasn't thought about the affect the photos would have on her family. It is completely unnecessary." Harrods department store boss Mohamed al Fayed, whose son Dodi also died in the crash, said he was angered by the publication. "This heartless pursuit of money brings shame on those responsible for producing such a vile publication," al Fayed said in a statement Thursday. "The editor and the author, who probably have families of their own, have no thought for the feelings of those who loved the princess, first and foremost her sons, the Princes William and Harry." The magazine's editor, Umberto Brindani, told Britain's Press Association that the photograph was "touching" and "tender" but not offensive. "As a thorough and informative news magazine, we have merely reported the publication of a book in France regarding Princess Diana's death," Bridani told PA. "We were the first magazine to publish them but I understand that others in Europe, France and Spain, will also publish shortly." The questions and puzzles remain years after Diana's death in a Paris tunnel. As CBS' 48 Hours has reported, Al Fayed has relentlessly accused the British government of orchestrating the death of Princess Diana and Dodi. As the car carrying Princess Diana raced into the Paris tunnel, it sideswiped a slow-moving white vehicle. Paint on the Mercedes and debris on the roadway confirm it was a Fiat Uno. 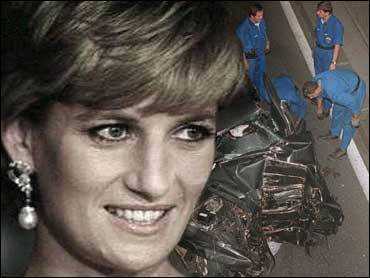 But conspiracy theorists believe the driver deliberately caused the crash as part of a plan to kill Princess Diana.